"I'll Wait for You Forever." Heartbroken when her childhood love never returned, Rose Smith soon learned she had even greater worries—she carried his child. Ten years later as a housemaid in London, she encounters Samuel Blackstone. The kind youth she adored has turned bitter with success. Feeling out of place in Sam's high-society world, Rose fears what he may do when he learns of their son…. A wealthy stockbroker, Sam is used to getting what he wants. And when he learns that Rose bore him a son, he wants to claim his family. But he'll have to convince Rose to trust him again if he's to have any hope of meeting the boy…or recapturing her heart. 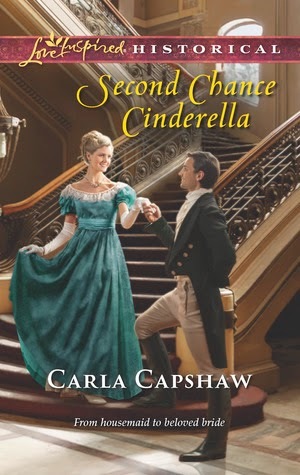 I hadn't read anything by Carla Capshaw before Second Chance Cinderella. The synopsis sounded interesting and I love a fairytale retelling. I was excited when I found out I had won the book through GoodReads. I started this book about elven at night waiting for my littles to go to sleep. By midnight I was half way through and decided, going to bed a little later wouldn't be bad so I could find out what was going to happen in this story. The twist to the Cinderella story was fun. Instead of having Rose meet her prince in the story, she has known him most of her life and is ready to marry him, but with no money, Sam, her prince needs to leave their town to start a new job opportunity. Promising to return soon to marry her and take her way, Sam leaves. After 9 years and some incidences that happened, Rose and Sam meet again in London. In these years, Sam has changed in many ways. Rose however has not. When are reintroduced to Sam he is a bit cold and distant and rich. Rose is still poor, but she has a reason to be happy. She is content, for the most part with her life. However, the past still haunts her. Sam had a bit of growing in the story to do. Rose also had to grow as well, but in different ways then Sam. I had a few issues with Sam when he started to threaten Rose in some instances when it came to their son. He was harsh to Rose in his persuasion tactics, but as the story progressed and his attitude changed, I could get past what he said. Rose had trust issues to get over and with her past, it was understandable why she had such a hard time with a history of being left behind by many people in her life. I really enjoyed the pacing of this story. If you don't count this nine year gap at the beginning of the story, this book only takes place over the span of a week or two. The writing and pacing kept me reading. Each character was unique and offered something to the story and they all meshed well. I think this is story is a great summer time read. A two-time RWA Golden Heart winner, Carla loves passionate stories with compelling, nearly impossible conflicts. She's found inspirational historical romance is the perfect vehicle to combine lush settings, vivid characters and a Christian worldview. Her debut inspirational historical romance novel, titled The Gladiator, is followed by The Duke's Redemption. Currently at work on her next novel, she still lives in Florida, but is always planning her next trip…and plotting her next story. Carla loves to hear from readers. To contact her, visit her Web site or write: Carla@carlacapshaw.com. I won this book from the GoodReads first reads giveaway. I was not required to post a positive review. Thank you to the author for hosting the giveaway. Nemo, It was a very cute story! Fairy tales retold in a real time setting are fun and make them more realistic. :-) Thanks for stopping by!